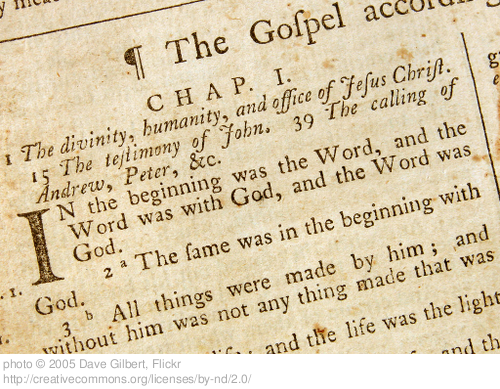 You wrote that “All Christians assume the Bible is the Word of God because the Bible says so…” Two things regarding this: first of all, recent surveys show that a shockingly low number of Christians believe the Bible to be the inerrant word of God. Evangelicals find this trend alarming. More liberal Christians are probably less concerned. But I think that many in our generation who assume the Bible is the Word of God have actually begun to believe this, not because of what the Bible claims, but because of our experience. For example, I have seen many of the Biblical truths that I was taught as a child come to pass: “Give and you will receive,” “A soft answer turns away wrath,” and “The love of money is the root of all kinds of evil.” I personally do not believe the Bible is the word of God only because the Bible says so – I couldn’t even tell you where in the Bible it says that. I believe the Bible is the word of God because I have seen the truths it talks about reflected in the world that I know, the experiences that I have had. The Gospel message turns up everywhere, inadvertently, and that resonates with me. You then went on to say that, “This is why I don’t identify with Christianity as an organized religion.” This is why many people do not like Christianity as a religion – it has strayed from its original purpose, transformed from what it was to what it is, which is a catalogue of beliefs and moral values. What was Christianity? What did it start as? It started as a community. Put aside the miracles and the testimonies – the community aspect is what set it apart. The love they had for one another is what drew people to them, and then to Christ. It is what drew me to Christ. I grew up in a Pentecostal evangelical church, very charismatic, but I loved it, and as a natural outpouring of that, I grew to love Christ. Why? Because I had wonderful friends there, and I met caring adults who wanted to help me grow and learn. I saw the close friends my parents had, and I was drawn to the love they had for each other. Something Christians and Christianity should never get away from is that they were, in the beginning, primarily about community. This really jumped out at me/resonates. If you asked this question of an Evangelical, Catholic, Methodist, Lutheran, Orthodox, etc., etc, ad nauseum you’d get a different answer every time. Who, then, is the “real” Christian? This, in an of itself, shows how “silly” the “this then that” line of reasoning is. Aside from that, if we really examine the 2000+ year backdrop of the belief in Jesus Christ- all of the social, cultural, political, economic, philosophical, academic influences at play- it seems audacious at best to think that some uniquely American, shiny, tidy, systematic protestantism is the only way to/expression of God and His purposes. Shawn- Thanks for encouraging this dialogue, I really hope that as more and more Christians engage, rather than run from, this conversation that we will eventually end up with a more authentic and, dare I say, believable faith. Timely too – we’re feeling a little burned by our latest church experience and just this morning debated giving another church a try, we couldn’t muster the will to go and be disappointed to find exactly the same thing we’ve found in so many other churches. So we ask all of these questions – is it our attitude? do we expect too much? grin and bear it? what about the kids? It’s such a mind game. Thanks for your feedback here, Steve. If Jason is up for it we’re going to try to post an email from him on Saturday and then my thoughts on Sunday. It certainly isn’t meant in any way to be a debate, but just a transparent discussion. Thanks for spreading the word on Twitter. We’ll also be posting on Facebook, so if there’s anyone you want to share it with, by all means do. The whole idea of “going to church” often seems forced and unnecessary. Yet Jesus spoke often of his flock, and one of the main foundations of the faith is in community. If J goes with the question I asked him at the end of this post (I can’t guarantee it), it will be interesting to see if this idea of the importance of church comes up. Yes, I will reply to your last questiona and I’m up for this discussion every week. I really have had so many good experiences and have been a part of numerous vibrant and encouraging communities. I want more of that and I can’t put my finger on why it seems difficult. Re-reading my comment, I sounded a lot more bitter than I really am. I’m still “in.” I’m just finding it more difficult to reconcile what I find in the Bible and what I experience, as Jason puts it, with the way that we do religion. Preach it Shawn! Makes me think of the old adage, “people do not care how much you know until they know how much you care.” People do not care about the beliefs of Christianity until they see the Believers care about them. @ Jason, you right to be disenfranchised by what you see in today’s church — a lot of us are. But do not throw the baby out with the bath water. The church may be “broken” but that does not change the truth of the Christianity’s claims. Thanks for reading Tim. It’s interesting to me that the church has been broken from Day 1, yet it seems that God and Jesus chose from the beginning to use this broken vessel to spread the good news. I think there is something valuable in the brokenness, something necessary. @Steve love your third (sort of second) paragraph that starts “Aside from that…” Well said. It’s funny cause my whole comment to Shawn at first was that I didn’t identify with organized Christianity. I never said I don’t believe in the Christian faith. I just need it to look more honest, authentic, alive, fluid, relevant, raw, accepting, all meeting a deeper sense of “being.” I also wonder if it has to be so discriminatory in the sense that other religions that are searching for truth get left behind. I’d love to hear your thoughts on the vehicle that Buddha gave which is lacking in Christ. Yea, I’m sure you’ll be able to find instances of Jesus saying the same things. I guess it seems that the Buddha taught a more obvious route in the Four Noble Truths and the Eightfold Path, which I think would help Christians get out of the way and make space for Christ in their lives. Funny that I should like something more concrete and organized, eh? : ) Jesus is like the bloody Riddler in most instances, almost more so than the infuriating aspect of Eastern Gurus. You know what it is? Christians just need to shut up so people have a chance to hear God. Just stop talking, stop convincing, stop preaching, stop everything. Be quiet. Christians make a lot of raucous that clouds the entire spiritual space that might be taken up by a person’s possible experience of God. i didn’t mean that in an angry, judgmental sort of way. More silence would be valuable. But so would more discussions like this (which I guess technically are silent since they’re in written form, but I think you know what I mean). I think there are problems with that approach. First it seems to ignore what the apostles and Jesus himself said about preaching the gospel, you may not agree with the popular methods used by evangelicals, but that is a separate issue which the bible does speak to. I think an obvious second problem is that you are assuming things about the nature of man and his ability to apprehend God correctly apart from revelation. Even if you view original sin as a non-totally depraved state, the bible is clear about the state of the human heart as self-deceptive and self-serving. I don’t know how you view Christian doctrine, but it seems to me shallow at some points the tendency to read out of the text the parts that confirm your predilections, even if they are meant to fit into a larger whole with a different meaning. I am not meaning to be overly critical, but I do think views on the most important issues of life should be able to stand to sound reasoning. This applies to me also, feel free to critique this response. Nicholas, what does all that do for you? Well to be honest Jason, not too much, I really wish life would be simpler. I entered this realm because I was looking for answers. The answers I thought I knew as a Christian were beautiful if in fact they were true, but I began to question(when my life seemed to break down) if I had good grounds other than my experience(which in my mind is still robust, supernatural, and hard to explain from naturalism). So it really was a quest for truth, reality, honesty, and somewhat borne from desperation. In some ways this is an end in itself, the quest for truth is part of what makes humans, well, human. But in other ways you are correct, this only seems to matter if at the end there is something that is worth the pursuit, something gained. I feel that if there is no way to adjudicate between worldviews or even the differences between you and I, how will I know if I am not completely self-deceived or delusional? This is why I try to reason. I also would be wary of starting the search for truth on the basis of “what it does for me” since from the start it seems you might miss truth that does not conform to what you feel it should be(oriented towards my existential needs). I don’t know if that is helpful, I hope I communicated somewhat clearly. I would ask what would you say to a reasonable conservative Christian who asked you the same question about all your questions toward Christianity? We will never reach perfection. We will never be without pain and confusion, I guess it’s how we live with those. But in our search for truth, it would have to DO something for us. If it is true and right, we would end up somehow “better” than before. Maybe the problem is in searching for “answers” instead of “truth.” What is great about Buddhism is its encouragement to accept what is. Always needing things to be different or better is a sure sign of one’s own perpetuating of suffering. Not saying I live that way very well but when I can it is helpful. Again, to me it is about “being.” I think I might be done searching for metaphysical answers to the world and why we’re here. How would we ever figure that out, and even if we did, I still wonder how it helps us live our lives. Again, I still think it is possible to live a more Buddhist like Christianity. I’m not necessarily discussing the existence of God or the truth of Christ, just how they are met, felt and experienced to the point of it bringing true meaning to my life – not just disciplined religiosity because I believe it’s right. This is a hard conversation to have in this context. I know we’re doing our best but it’s hard. Nicholas and Jason – I haven’t had a chance to read your comments in depth, but I’m actually rather overwhelmed with both of you guy’s ability to be honest and still directly challenge things that you disagree with. Thanks for the refreshing, interesting dialogue. I look forward to reading through the comments in detail tomorrow when I have a little more energy. I can feel your frustration with metaphysical inquiry. However I do feel that the truth these questions get at is really the foundation for everything else, meaning and purpose included. I guess the search has not burned me out yet, even though at times I feel the weight. But like I said earlier, I look for continuity, the same reason I use everyday I would also inform my metaphysic unless I have good reason to do otherwise. This to me seem prudent and responsible, how can you possibly judge meaning and purpose with out metaphysical truth that affirms it? If you abdicate reason in the process how will you not end up subjectively affirming whatever strikes your fancy? And how could you affirm or condemn others in any real sense if they feel meaning in something morally objectionable? I like the way C.S. Lewis put it in Mere Christianity, using the analogy of the solitary man seeking for God who can only go so far as a finite being, and theology being the way to go beyond what he can reach on his own. I wonder how you get around the metaphysical(especially teleological) questions and hope right to meaning with no clarity of what “being” is. It seems to me from your email to Shawn that you do use reason to deconstruct the Christian faith(you said a lot I would probably want to challenge), but then back off reason when it comes to other areas. I am not trying to be critical but I wonder where the seeming duality of your approach starts and ends. Do you really feel that there is not a Christianity that does what you are looking for in an existential sense? Did you not find meaning of purpose in what it said about the world and your place in Christ? To me these are some of the stronger points commending Christianity. This is what I meant when I asked you to answer to the Christian. Shawn and J Mac, thanks so much for your openness in wrestling with the tough questions of life. It’s fun to think back to when we first met…J definitely stood out. I’d like to share my thoughts on the Bible being the Word of God. Partly in hopes of adding value to the conversation and also to get feedback on my ideas to see what I’m missing. As I think back, I recall growing up thinking that the Bible I had was somehow dictated to the author directly from God…in English (actually King James English). I’ve experienced bits and pieces of life since then and have given it more thought as I consider my responsibility in helping my kids develop their understanding of how to view the Bible. My current view is that the Bible consists of accounts that are generally historical, philosophical (world views), and predictive (prophetic). I didn’t mention what role God has in this because I think it would be in the same way that God is related to the physical world in general…not more or less. I think Biblical claims should be tested with current knowledge (historical, scientific, etc.) and experience, but with historical context at the forefront of the inquiry. My recent thinking on theological topics has been heavily influenced by NT Wright. He has written on the authority of Scripture and how the Bible relates to the present time. I may not be interpreting him correctly, but he talks about history, the Bible and present times in metaphor as acts in a play. We’re currently in the 5th act and need to act it out without a formal script. The information we have to help us are the first four acts of the play. We should be able to glean out the primary elements, but there will be uncertainty about the fine details. History and the Bible are the acts we can look back on to help us move forward in current act without a formal script. Some general details about the future have been given in the Bible, but exactly how the current act will play out isn’t clear. I think Wright would also caution claiming ‘the authority of Scripture’. He refers to Jesus’ claim that all authority in heaven and on earth have been given to him. Jesus doesn’t claim that all authority is given to the Bible. Thanks for joining the conversation, Mike. You have included some intriguing thoughts in your comment. I am especially drawn to that last quote, “Oh, no, it’s far more true than that.” I often wonder if we miss the entire point of the Bible, that being that it is more of a narrative telling a story of God’s interaction with us, than it is a scientific document provided to us so that we can know empirical facts. Great hearing from you. I hope you and your family are doing well. I’m assuming that’s Mike Miller aka “Moose”! I like your thoughts buddy. Yes, I like “it is far more true than that” for two reasons. First, it speaks to the incomprehensibility of God and his purpose of the Bible and all things human. And second, to me, it speaks to the existential reality or lived truth of what the Bible is attempting to help point towards. We are living life here people, hello!! We weren’t put on this earth to believe the right thing in order to believe the right thing so we could die believing the right thing. Nicholas, when I talk about “being” I am talking about the existential view of being as in not static, not fixed, always becoming, which is an ongoing experiential existence that we are having as human beings every moment. It is in these moments that we are to live. Also, I am not dissing reason completely, just not worshipping it as the only way of knowing. The existentialists talked a lot about reason not being the only way to obtain knowledge. It’s actually funny, because Christians, above all else, should be adopting that view since their beliefs are so largely based on faith. We can talk faith and reason all we want but we can reason anything to make great sense if we want. That’s why to me it is about looking at where the rubber meets the road – it’s not just in intellectual thought and argument. Also, yes there is plenty of room for me to fit into some sort of existential Christianity but I’m trying to explore at this point an existential existence that might still lead me to God or even Christ, based on the lived truths I find and my own experiential openness to a “God” above. Just putting existential in front of what we know to be “Christianity” might only be giving it a facelift but not altering it’s complete personality. I could also end up finding my way back toward a more traditional type of Christianity, or ditching it altogether. I also think there is some truth in materialism which I never would have thought before.